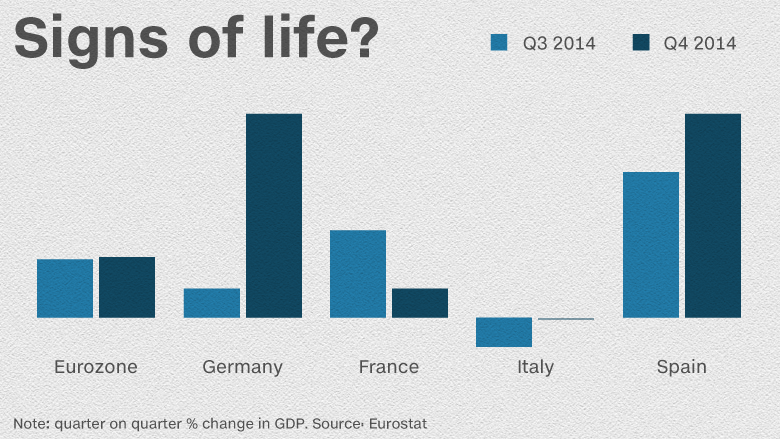 German consumers are spending again, sparking Europe's economic engine back into life. Fourth quarter eurozone GDP rose by 0.3%, compared with the previous quarter, thanks to a big boost to growth in Germany, the region's biggest economy. Third quarter growth was 0.2%. Officials noted a marked increase in consumer spending, supported by high levels of employment -- there were 412,000 more Germans in work than a year earlier -- rising wages and cheap oil. "Germany is earning back its moniker as the 'powerhouse of Europe'," commented Tom Beevers, CEO of Stockviews. Germany accounts for about 30% of the eurozone GDP and its economic health is vital to the region. Other countries continue to struggle, however, most notably the second and third biggest players -- France and Italy. The French economy lost momentum in the fourth quarter, while Italy just about managed to avoid a third consecutive quarter of contraction. Still, both countries performed slightly better than expected and the eurozone outcome was at the upper end of market forecasts. Shoppers seem to be taking advantage of falling prices, rather than waiting for even bigger bargains to come. "It is notable that not only did eurozone consumer confidence rise to a six-month high in January but consumers' willingness to make major purchases now rose to an eight-year high," said Howard Archer, chief economist at IHS Global Insight. European stocks strode higher by midday, and Germany's benchmark DAX index broke through 11,000 points for the first time before trimming its gains. Experts say the stronger end to the year bodes well for 2015, and the annual rate of growth could pick up to around 1.5%, from 0.9% in the fourth quarter. Cheap oil, and falling prices generally, the weaker euro and massive money printing by the European Central Bank should "more than offset the serious short-term risks such as Greece and Russia," noted Berenberg senior economist Christian Schulz. German Chancellor Angela Merkel said Thursday that the West could hit Russia with more sanctions if it fails to honor another Ukraine ceasefire due to take effect Sunday. And Greece is running out of time to negotiate a new financial rescue package with its eurozone peers. Its economy started shrinking again in the fourth quarter, hit by political turmoil.